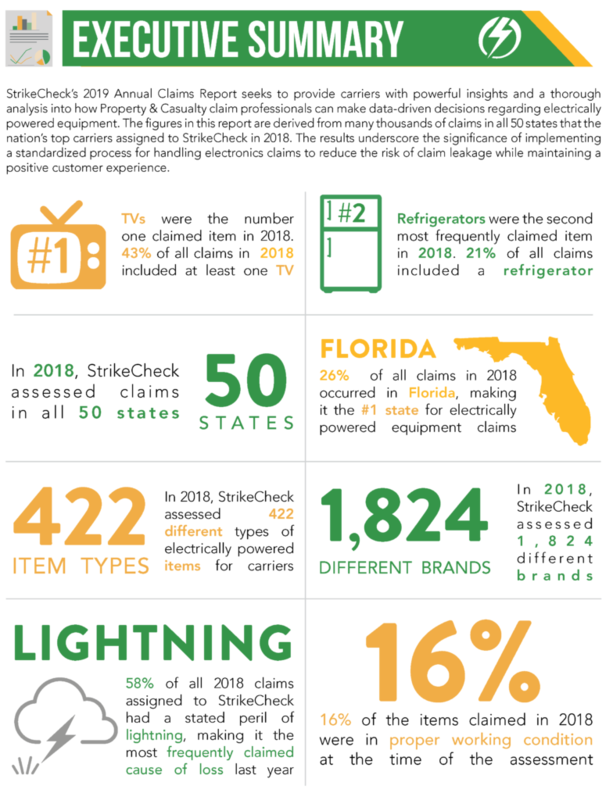 CHARLOTTE, N.C., March 6, 2019 — StrikeCheck, a leading provider of electronics damage assessments for Property & Casualty insurance carriers nationwide, announced the release of its 2019 Annual Claims Report today. The statistics featured in the report can help carriers make data-driven decisions and highlights areas where they can improve claim leakage control. The risk of claims leakage is even greater following catastrophic events. 2018’s major hurricanes, Florence and Michael, led to an extraordinarily high number of claims for items that were determined to not have been damaged by a covered peril. With the increasing frequency of large-scale catastrophes, it is imperative to involve a third party expert to control claim leakage without negatively affecting customer satisfaction. A qualified expert can help carriers decrease their cycle times during periods of high claim volume while reducing claim leakage by verifying repairability and cause of loss. StrikeCheck investigates electronic and specialty contents claims, exclusively on behalf of insurance carriers, nationwide. We boast the industry’s most comprehensive manufacturer relationships and experience across thousands of investigations annually, delivering cost-effective, comprehensive solutions for complex claims. To learn more about our services or to submit an assignment, visit strikecheck.com, email claims@strikecheck.com, or call (888) 980-8544.